Make your display interactive! The InputPup allows you to connect up to 8 inputs to your LOR network. Multiple Servo Pups can be used to increase available inputs. Use of input triggers requires version 2.1.2 or higher of the Light-O-Rama S2 Software Suite. Provides connections for Gnd, (+9vdc power input) and 8 Trigger Inputs. Power is usually provided by accessory power found on the Cat5 cable. If accessory power is not available on the LOR network, power can be provided using a 9vdc power supply. 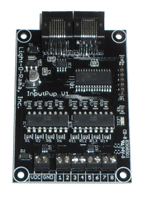 For increased reliability, the InputPup's inputs are optically isolated. Inputs are also ESD protected meeting the IEC 61000-4-2 level 4 standards: 15 kV (air discharge), 8 kV (contact discharge).